deer in the yard, originally uploaded by jahansell. Looked out the window, there was a deer standing in my lettuce and bean patch. I don't have much lettuce nor beans - can't spare any for a hungry deer! Went out to discuss the matter, but the deer was adamant - he or she liked it right where he or she was, and wasn' t in the mood to vacate. 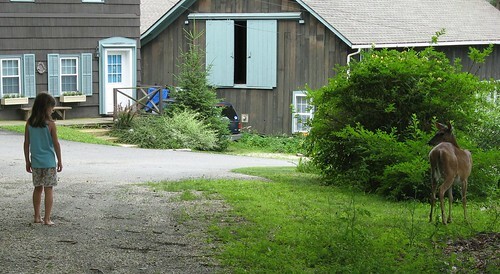 Went to get my camera, and the deer off strolled down the driveway a bit (but not before posing a little). "I'll be baaaack" the deer said, probably, in deerish.